­ just the cold, hard modern science. As scientific knowledge grows exponentially, Darwin's theory of evolution becomes more debatable and hotly contested by researchers on both sides of the growing scientific controversy. 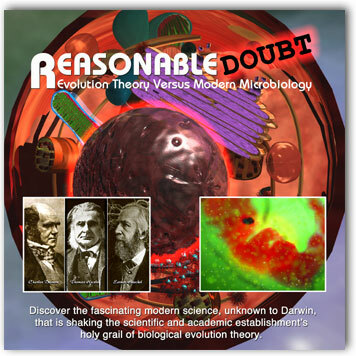 REASONABLE DOUBT presents a logical rendition of some of the fundamental problems evolution theory faces in the light of modern scientific knowledge with easy to understand explanations, animations, interviews and logical illustrations. This thought compelling and no-punches-pulled DVD illustrates dissenting scientific issues in the fields of microbiology, physics. cosmology, and statistical probability. Every intellectually honest student of life, as well as teachers and school board members, needs to watch this DVD! This is not a Creation or Intelligent Design presentation and it does not argue for any particular alternative theory for evolution­just the cold, hard facts—you can deal with that! 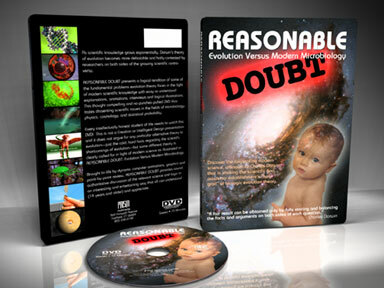 Brought to life by dynamic computer animations, graphics and point-by-point review, REASONABLE DOUBT provides sound, authoritative discussion that is clearly, logically and entertainingly presented. A Summary of basic evolutionary claims from Big Bang to Bacteria to Biologist macro-evolution. _____Pangenesis, Universe Rotates Around Earth, Smallest Atomic Building Blocks, Light Speed. ____1. What Came First, DNA or the DNA Replication Mechanism? ____Why this is an important issue?